YogaFaith is committed to providing ongoing Christian Yoga, continuing education opportunities to expand your knowledge. Chose from Trauma Sensitive, 12 Step, Yin Yoga, Children’s, Adaptive, and Meditation / Nidra. Specialty training’s are open to everyone, no previous training is required. Pick one or more as an elective towards your Yoga Alliance Certification. Once you begin we immediately plug you into our 12 Step Group, you will never be alone. Explore Energy, Meridians, Fascia, Muscular and Skeletal systems. 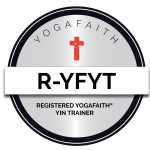 Explore the powerful and healing effects on the mind, body, spirit and soul that Yin has. Designed as a 4 week training, go at your own pace. 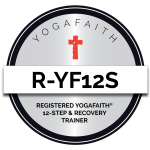 Become a Certified Yin Trainer in one month or less! May begin anytime and plug into Meditation and Nidra Group, ‘see’ you April 6th!